To find ratings, more things to do, and more tourist information, use the Tamarindo itinerary builder. Newark, USA to Tamarindo is an approximately 10-hour flight. Due to the time zone difference, you'll gain 1 hour traveling from Newark to Tamarindo. In December, Tamarindo is warmer than Newark - with highs of 90°F and lows of 70°F. Wrap up your sightseeing on the 28th (Thu) early enough to travel to San Jose. Start off your visit on the 28th (Thu): explore the world behind art at Precolumbian Gold Museum, get engrossed in the history at Jade Museum, and then take in the exciting artwork at Galeria Namu. To find where to stay and more tourist information, go to the San Jose tour planner. Traveling by flight from Tamarindo to San Jose takes 2.5 hours. Alternatively, you can drive; or take a shuttle. Traveling from Tamarindo in December, expect nights in San Jose to be about the same, around 66°F, while days are slightly colder, around 78°F. Wrap up your sightseeing on the 29th (Fri) early enough to travel to Manuel Antonio. Start off your visit on the 29th (Fri): enjoy the sand and surf at Playa Manuel Antonio and then relax and rejuvenate at some of the top local wellness centers. On your second day here, enjoy the sand and surf at Playa Biesanz, whizz through the canopy at some of the top local zipline courses and adventure parks, and then look for gifts at Beso Loco Boutique de Playa. To see other places to visit, maps, reviews, and tourist information, refer to the Manuel Antonio itinerary maker. Traveling by combination of flight and taxi from San Jose to Manuel Antonio takes 1.5 hours. Alternatively, you can take a bus; or drive. In December, plan for daily highs up to 78°F, and evening lows to 66°F. Wrap up your sightseeing on the 31st (Sun) to allow time to drive to Jaco. Start off your visit on the 31st (Sun): take in the exciting artwork at Tico Pod Art House & Gifts and then surround yourself with nature on a nature and wildlife tour. To see ratings, where to stay, reviews, and tourist information, read our Jaco vacation builder. You can drive from Manuel Antonio to Jaco in 1.5 hours. Alternatively, you can ride a ferry; or take a bus. Finish your sightseeing early on the 31st (Sun) to allow enough time to drive to La Fortuna de San Carlos. 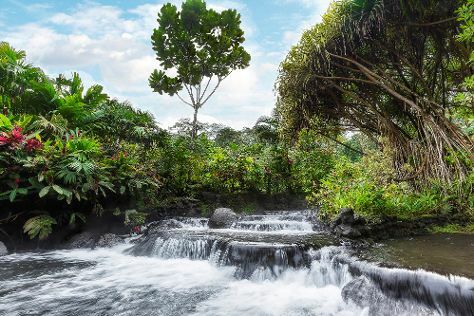 Kick off your visit on the 1st (Mon): relax and rejuvenate at Tabacon Hot Springs and then trek along Arenal Natura Ecological Park. Get ready for a full day of sightseeing on the next day: trek along Ecocentro Danaus, then admire the sheer force of La Fortuna Waterfall, and then let the river carry you with a rafting and tubing tour. To find maps, other places to visit, where to stay, and tourist information, read our La Fortuna de San Carlos trip planner. Traveling by car from Jaco to La Fortuna de San Carlos takes 3 hours. Alternatively, you can do a combination of shuttle and taxi. You will have some time to spend on the 3rd (Wed) before leaving for home.